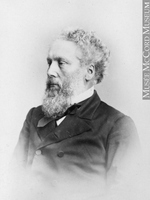 LOGAN, Sir WILLIAM EDMOND, geologist and geological cartographer, founder and first director of the Geological Survey of Canada; b. 20 April 1798 at Montreal, L.C., third son of William Logan, a baker and owner of real estate, and of Janet Edmond, both from Scotland; d. 22 June 1875 at Cilgerran, Pembrokeshire, Wales. William Edmond Logan’s education was begun in Mr Alexander Skakel*’s school in Montreal, but at the age of 16 he was sent with his older brother Hart to high school in Edinburgh. In 1816 he registered as a medical student at Edinburgh University where his subjects included logic, mathematics, and chemistry. Although he may not have been impressed at the time, his lectures in chemistry probably provided his first exposure to theories on the formation of rocks and minerals: the professor of chemistry, Dr Thomas Charles Hope, was an ardent supporter of the Neptunian theory of rock formation – that all stratified rocks were formed in water. Logan left the university at the end of his first year, even though his scholastic achievement was high, to enter the London business establishment of his uncle, Hart Logan, for whom he worked for over 20 years. The systematic procedures of accountancy undoubtedly were a training which influenced William’s geological field measurements in later years; his geological maps and geological sections were drawn with a skill and accuracy far superior to those of his contemporaries. Logan probably became interested in geology because mining activity and construction materials such as building stone may have been a principal part of his uncle’s business. After 1827 the management of the business was left to Logan, who devoted days and many evenings to his work. The social contacts with “much company, rich food, and rich wine” were not particularly palatable and were considered prejudicial to his health. During this period he took lessons in art and languages, and continued the study of mathematics. In 1829 he went to Italy, possibly as a tourist, for his diary records descriptions of numerous churches, palaces, gates, bridges, and other buildings; he was also most diligent in recording the types of rock in columns and other parts of the great edifices. In 1831 Logan moved to Swansea, Wales, where he was appointed manager at the Forest Copper Works, Morriston, a copper smelting and coal mining establishment in which his uncle had invested a substantial sum of money. His prime task was to set up a proper system of accounts but Logan soon realized that a continuous supply of coal for the smelters had to be guaranteed, and that this could only be done with the help of accurate maps of coal seams from which reserves could be determined. Existing geological maps of Wales were highly generalized with too little detail to make them useful. Logan therefore set out to make field observations and to plot them on the available topographic maps of South Wales, recording the continuity of seams and the succession of rocks. A high degree of accuracy was obtained by using surveying instruments such as a compass, a theodolite, and probably barometers. His data included subsurface information from miners, and subsequently from drill cores. By these means he constructed, for the first time, true-scale horizontal cross-sections upon which the underground occurrence of the coal seams was mapped. The results allowed predictions about the depths of mines and the discovery of coal seams that were not exposed at the surface. In 1835 the Geological Survey of Great Britain was initiated and when its first director, Sir Henry Thomas de la Beche, saw Logan’s maps for South Wales he adopted them, because “the work on this district [was] of an order so greatly superior to that usual with geologists.” Logan’s contribution is still recognized in that modern revisions of the geological maps for South Wales bear his name as an original co-author. Geology had become a popular science in the early decades of the century, with the formation of the Geological Society of London in 1807, the publication of a geological map of England and Wales in 1815 by William Smith, and of a book on the geology of England and Wales by William Daniel Conybeare and John Phillips in 1822. In 1834, while on a business trip in France and Spain, Logan mentions in his diary the works of Charles Lyell who, at that time, was one of the principal authors in the field of geology. On such trips Logan carried painting supplies; some of his watercolours and sepias are held today in trust by the Geological Association of Canada. Logan helped to organize the Swansea Philosophical and Literary Institute in 1835 in order to encourage study of natural history and preservation of antiquities. Between 1836 and 1842, as honorary secretary of the institute and curator for geology, he organized an extensive collection of specimens, well labelled and displayed, including two fossil tree trunks which are still in the grounds of the institute’s building in Swansea. He was elected to the Geological Society of London in 1837, and in 1840 presented to it a paper outlining his concept of the origin of coal. The rock succession, including the coal seams, in South Wales suggested that coal had accumulated in situ: below every bed, he found, there occurred persistently an underclay with numerous fossil tree stumps Stigmaria. He was further convinced of the theory’s validity by finding later the same association of underclay and stumps at the bottom of coal beds in Pennsylvania, Nova Scotia, and Scotland. Logan’s concept of the in situ formation of coal is still considered to be generally valid. Logan’s employment in Swansea ended in 1838 with his uncle’s death but he continued to live there and to make geological maps of South Wales. In July 1841 the Natural History Society of Montreal and the Literary and Historical Society of Quebec petitioned the first united parliament of Upper and Lower Canada to allocate an amount not exceeding £1,500 sterling to defray the probable expense of carrying out a geological survey of Canada. Logan was immediately interested in the position of provincial geologist and requested the support of several eminent British geologists in his application. Canadian friends, principally in the Montreal and Quebec societies, also placed his name before the governor of the province. The reputation Logan had acquired from his skilful mapping of the geology of South Wales, and the fact that he was a native Canadian, obtained him the appointment in the spring of 1842 at an annual salary of £500, just half of what he had been receiving in Wales. The task of the new Geological Survey was to furnish “a full and scientific description of the country’s rocks, soils, and minerals, to prepare maps, diagrams, and drawings, and to collect specimens to illustrate the occurrences.” These fundamental objectives were initiated by Logan in such a way that the Geological Survey still continues its work within a similar framework and on a similar pattern. Logan recognized that a proper geological survey of the vast wilderness of Canada would require a permanent institution. At the same time he realized that the politicians who would have to provide money for his organization would only be impressed by practical results and by indications of both actual and potential mineral occurrences from which the country would benefit economically. His task was going to be a difficult one, and capable assistants would be required. Geological mapping would be hindered by the fact that topographic base maps were not available; Alexander Murray*, a retired naval officer with no previous geological experience, proved, however, to be a most able field mapper. Rock and soil specimens would need chemical analyses; the first chemist Logan engaged, Édouard-Sylvestre, Comte de Rottermond*, proved to be incompetent (and subsequently a considerable nuisance), but after 1847 a self-taught chemist and mineralogist named Thomas Sterry Hunt* pursued chemical investigations which gave him a world-wide reputation and added to the eminence of the Geological Survey. 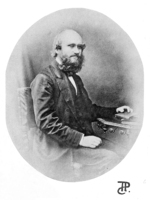 During his tenure as director, Logan was to engage capable field and laboratory assistants, such as James Richardson*, Robert Bell*, Edward Hartley, Thomas Macfarlane*, Charles Robb, and Henry George Vennor*. He recognized that Professor James Hall, of the New York Geological Survey, Albany, a renowned paleontologist, would provide valuable advice on the geology of Canada. Hall declined an offer to join the survey in 1854 and so Elkanah Billings, a lawyer and newspaper editor, became the survey’s paleontologist. 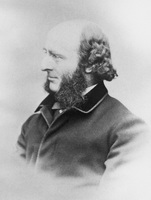 One of Logan’s close associates in Montreal, and a leading authority on the geology of New Brunswick and Nova Scotia, was the influential John William Dawson*, principal of McGill University. The first “office” of the Geological Survey was set up in the autumn of 1843 in a Montreal warehouse provided by Logan’s brother. By the end of the year Logan was seeking continuance of the survey and urging government leaders to establish a more satisfactory and definite fiscal arrangement. He realized that if the results of his work were made obvious, they could have an influence on politicians and the public. He therefore rented a house in the spring of 1844 on Great St James Street, Montreal, to display his collections as well as for offices and laboratory. In April 1844 his “Report of progress for the year 1843” was submitted to the legislature, the first of a yearly series. He also took great care to talk and write to legislators and perform small tasks on their behalf. By 1845 Logan could demonstrate notable achievements in return for the original £1,500 grant, although he had spent an additional £800 from his own pocket. The Legislative Assembly in that year quickly passed a bill, which Logan himself had drafted, and £2,000 per annum became available for a period of five years. The act of 1850 experienced opposition, and to ensure its passage Logan had to spend time reluctantly in Toronto, then the seat of government, and away from his field work. After some delay, the same financial support was provided for an additional five years. In 1854, however, the government created a select committee on the Geological Survey. It received evidence from Logan and Hunt along with numerous distinguished individuals including Professor James Hall, Albany, Professor Edward John Chapman*, Toronto, Alexander Jamieson Russell, Quebec, and the Reverend Andrew Bell, L’Orignal. The select committee was sufficiently impressed to recommend an increase in the survey’s facilities, the republication of all reports, and the compilation of a coloured map of Canada. In 1855 the legislature granted Logan $20,000 per year for five years along with $8,000 for reports and maps. From 1861 to 1863 annual appropriations were made. By January 1864 he had advanced $10,000 from his own resources to cover salaries and publication costs. During the spring the government changed, and a sympathetic legislature provided an annual grant for another five years. Geological mapping of the Canadian provinces, in which Logan himself participated actively, could be done in the mid-19th century only by a person with considerable physical strength and stamina, perseverance, unrelenting resourcefulness, and untiring enthusiasm. (The same qualities were necessary to obtain funds from a succession of governments which remained sceptical of the survey’s worth.) Travel around the provinces was difficult. There were steamships on the Great Lakes and the Rideau Canal had been built between Bytown (Ottawa) and Kingston; but in the early years of the survey travel from Montreal to Canada West was by stage coach through the United States. Geological traverses were made by walking, with distances determined by counting paces, establishing lines laid out by compass. In the field, where he had an Indian guide, John Basque, Logan’s tent was a blanket held up by two poles. He describes conditions as “living the life of a savage, sleeping on the beach in a blanket sack with my feet to the fire, seldom taking my clothes off, eating salt pork and ships biscuit, occasionally tormented by mosquitoes.” More than once local inhabitants wondered about the sanity of this red-bearded individual dressed in a tattered and streaked jacket and patched grey trousers stuffed into large, torn, and roughened field boots, his hair matted with spruce gum, his spectacles cracked. The impression was heightened by his seemingly continuous mutterings, wanderings in a zig-zag fashion, and hammering on the rocks to obtain chips which he wrapped in paper with great care. In the field, Logan usually started at dawn and continued throughout the day and into the evening until he could no longer see distinctly. By the light of the campfire he would work until a late hour to ink-over the pencilled notes and figures made during the day and plot on field maps all the measurements and dimensions which had been recorded. His geological observations were authenticated by pen and ink sketches which clearly reveal his artistic talents. His note books, held by the Geological Survey, are exemplary models for recording field data. By the end of the field season of 1843, Logan and Murray had established that the united Province of Canada could be divided into three well-defined geological areas. A division of folded rocks extended through the Eastern Townships and the Gaspé Peninsula. Between Montreal and the Detroit River were Paleozoic rocks, flat-lying but broken into two parts by a band of metamorphic gneisses and schists extending for several miles east of Lake Ontario. A northern division of complex metamorphic rocks would present a formidable task of understanding. In order to justify the continued existence of the survey, Logan immediately started a search for an obviously valuable mineral resource, coal. In the summer of 1843 he compiled for use in comparison a detailed section of the coal-bearing strata near Joggins, Nova Scotia. Subsequently he traversed the north and south shores of Chaleur Bay but he soon recognized that the exposed strata are geologically older than the Carboniferous strata, such as at Joggins, in which beds of coal occur. In the summer of 1844, Logan with Murray traversed the north shore of Gaspé, then went up the Cap Chat River to its headwaters and down the Cascapédia River to Chaleur Bay; the highest peak located on this traverse was named Mount Logan – against his wishes! The expedition, which provided both topographic and geological information, established that coal would not be found in the area. In 1845 Logan made the first of several expeditions across the ancient rocks north of Montreal. He found evidence of glaciation in polished, scratched, and grooved rock surfaces. He commented on the numerous veins and dikes and especially the occurrences of metallic minerals which would provide an impetus for the development of a mining industry. His report included observations on iron, lead, and copper, and such building stones as marble and slate. The next year he examined the north shore of Lake Superior specifically for occurrences of copper, within a rock sequence he named the Upper Copper-bearing Series, a major discovery having been made on the south shore. In 1847 and 1848 additional occurrences, like that being mined at the Bruce Mines copper deposit, were sought along the north shore of Lake Huron. For each prospect he wrote a cautious report presenting factual observations in a carefully worded style. He pointed out that the high cost of transportation, machinery, and labour would make only the richest deposits suitable for economic development. His objective reports did not, of course, have a kind reception from mining promoters. (On several occasions during his tenure as director of the survey he was called upon to evaluate mineral occurrences. Whenever evidence of fraud by citizens became obvious, his reaction was dismissal of the perpetrators from his office bluntly and swiftly.) Apparently Logan did not observe any evidence of the deposits of silver near Cobalt, of nickel at Sudbury, and of uranium north of Blind River. From 1847 to 1851 Logan turned his attention to the complex formations of the Eastern Townships, eventually tracing the geology from New York State nearly to the tip of the Gaspé Peninsula. He examined closely the copper occurrences in the vicinity of Sherbrooke, and the alluvial gold deposits of the Chaudière River. Deposits of serpentine found in the area would have had commercial value as a decorative stone except that the occurrences of asbestos, then considered a mineralogical curiosity, made it unusable. In 1860, near Quebec City, he recognized a major geological phenomenon when he realized, on the basis of fossils identified by Billings, that the folded rocks had been faulted and great masses had been thrust northward up and over younger formations. This break, which separates the folded rocks to the south from the flat-lying rocks to the north, is still known as Logan’s Line. 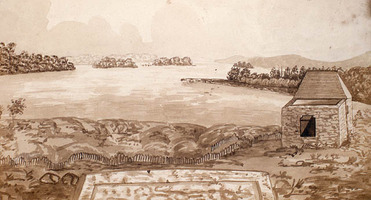 In 1851 and subsequent years Logan’s main attention was turned to the rocks north of the St Lawrence River primarily in the vicinity of Grenville, Quebec. In 1863 he defined the Grenville Series as a succession of gneisses and crystalline limestones intruded by dikes and granites. The limestones contain distinctive layerings and internal tubular structures which he concluded were the remains of fossils, and to them his friend J. W. Dawson applied the name Eozoon Canadense. To Logan these structures provided a strong argument for the occurrence of life in these very ancient rocks. Subsequent study has demonstrated that similar features can be formed by inorganic processes but other evidence for abundant life in the rocks of the Precambrian is now well established. To the generally flat-lying rocks north of Lake Huron, resting on the Grenville Series, Logan in 1855 applied the name Huronian. In 1863 he applied the name Laurentian to the seemingly more ancient rocks north of the Ottawa River and in the Adirondack Mountains of New York; he considered them the oldest rocks in North America, perhaps influenced by the then accepted theory that granitic rocks formed the original crust of the earth. Modern scientific methods have proven his interpretation wrong but his names are still used though in a different sense. In 1841 Logan became the first to recognize in North America the tracks of Carboniferous vertebrate animals in rocks at Horton Bluff, Nova Scotia. He found in 1851 distinctive trails of invertebrate animals in Cambrian rocks near Beauharnois, Quebec. His description in 1846 of the St Lawrence River ice pack near Montreal causing damage to buildings along the shore was subsequently used in the designing of the Victoria Bridge [see James Hodges]. He also was the first to give a scientific explanation of land slippages in clays along the St Lawrence River. Such failures still occur to this day. The government of Canada was asked to participate in the Exhibition of the Industries of All Nations in London in 1851 and Logan organized an extensive collection of Canadian minerals along with a geological map. The display was described as “superior . . . to all countries that have forwarded their products to the exhibition.” It did not receive an award primarily because Logan himself had acted as a juror in mineralogy and metallurgy, for which he received a medal from the Prince Consort. At the Paris Exposition of 1855 the collection of minerals displayed by Logan was awarded the Grand Medal of Honour and the emperor of France, Napoleon III, presented Logan with the Cross of the Legion of Honour. In 1862 Logan was again called upon to display Canadian materials at the International Exhibition in London. Although the collection was of high quality, Logan, because of administrative and publication problems within the Geological Survey, and his participation as a juror at the exhibition, responded with less than his normal enthusiasm. He was now 64 years old. Logan’s contributions to the geological literature are not particularly extensive, despite his diligence in assembling accurate data. The culmination of his years as director of the survey was, however, the publication in 1863 of the Geology of Canada, a volume of 983 pages with Murray, Hunt, and Billings as co-authors, which even to this day is a basic reference for geological work. The volume was followed in 1865 by an atlas of coloured geological maps covering the entire area from Newfoundland and Nova Scotia to the central United States and Canada. The publication of a larger geological map of Canada in 1869 required such diligent attention that it is said Logan’s eyesight was impaired. 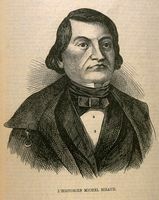 Logan’s first major honour was election in 1851 as a fellow of the Royal Society; he was the first native Canadian so honoured for work in Canada. Queen Victoria bestowed a knighthood upon him in 1856; only two other Canadians had been distinguished in this manner. At the same time the Geological Society of London awarded him its distinguished Wollaston Medal. Upon his return to Canada after receiving these honours, McGill University conferred on him the degree of lld. 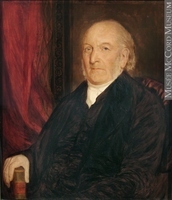 The Canadian Institute, which had been founded in 1850 with Logan elected its first president, gave a public reception in Toronto and commissioned his portrait in oil. The Natural History Society of Montreal gave a soirée in his honour. 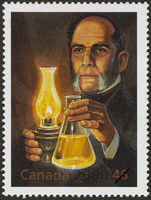 In anticipation of having to make a public address, he wrote “if speech-making is to become the consequence of distinction, I shall soon wish distinction far off.” His contribution to the geological sciences was again recognized in 1867 when the Royal Society of London awarded him the Royal Gold Medal with specific reference to his geological map of Canada. Sir William Edmond Logan was indeed an extraordinary man. Starting a major career at the age of 44, he organized, directed, and contributed in a substantial way for more than a quarter of a century to the Geological Survey of Canada. Logan stated: “The object of the Survey is to ascertain the mineral resources of the country,” and the survey still operates on this principle. Subsequent to 1855 he saw the development of a major copper-producing area in the Eastern Townships, where the Acton Mine was said to be the largest copper mine in the world in its time. The Geological Survey’s greatest contribution during Logan’s tenure as director was producing reports and maps, which established the fundamentals of Canadian geology; especially important were those for the north shore of Lake Huron and Lake Superior where rich beds of copper, nickel, uranium, iron, platinum, and other metals occur in the ancient rocks of the Precambrian. During the middle part of the 19th century, the rigours of field work in the Canadian wilderness demanded exceptional physical strength and endurance, and the administrative problems of a government organization along with the arrangement of international exhibitions demanded political skill and a sense of dedication to profession and country. So determined was Logan to continue the Geological Survey that he was willing to provide financial support from his own funds when government money was not immediately available. He was a benefactor of the discipline of geology and McGill University in providing the bulk of an endowment of $20,000 for a chair in geology and a medal for the geology student with the highest academic standing. With all this he seems to have been a shy person, even an introvert, and was most uncomfortable at social gatherings. The diligent and strenuous effort he made as director of the Geological Survey placed him in the limelight and he was apparently prepared to endure some personal discomfort in it because he drew satisfaction from acquiring national and international recognition for Canada. Sir William officially retired from the Geological Survey on 30 Nov. 1869, to be replaced as director by Alfred Richard Cecil Selwyn* who had previously directed the Geological Survey of Australia. Sir William took up residence with his sister, Elizabeth Gower, at Castle Malgwyn at Llechryd, Wales. He returned to Canada several times, however, and for a few months in 1871 assumed temporary directorship of the survey while Selwyn was in British Columbia doing field work. During the summer of 1874 Logan spent several weeks in the Eastern Townships and made plans for some further subsurface drilling in order to demonstrate that his geological interpretation of the complex structure was correct. But in the spring of 1875 his health was failing noticeably. He died on 22 June 1875 in Wales and is buried in the yard of the church of St Llawddog at Cilgerran, Pembrokeshire, Wales. Sir William had not married and had devoted long periods to geological field work as well as to being principal administrative officer of Canada’s first government scientific organization; his life of loneliness, to some degree self-imposed, was culminated by burial remote from the land for which he had worked so diligently. Canada, Province of, Legislative Assembly, Journals, 1844–45, app.W, “Geological Survey: Report of progress for the year 1843.” [Logan et al. ], Geology of Canada. F. J. Alcock, A century in the history of the Geological Survey of Canada (Ottawa, 1947), 11–25. Robert Bell, Sir William E. Logan and the Geological Survey of Canada (Ottawa and Montreal, ). B. J. Harrington, Life of Sir William E. Logan, Kt., first director of the Geological Survey of Canada (Montreal, 1883); “Sir William Edmond Logan,” American Journal of Science (New Haven, Conn.), 3rd ser., XI (1876), no.61, 81–93. J. M. Harrison and E. Hall, “William Edmond Logan,” Geological Association of Canada, Proceedings (Toronto), XV (1963), 33–42. A. H. Lang, “Sir William Logan and the economic development of Canada,” Canadian Public Administration (Toronto), XII (1969), 551–65. C. G. Winder, “Logan and South Wales,” Geological Association of Canada, Proceedings, XVI (1965), 103–24; “Where is Logan’s silver fountain?” Geological Association of Canada, Proceedings, XVIII (1967),115–18. C. Gordon Winder, “LOGAN, Sir WILLIAM EDMOND,” in Dictionary of Canadian Biography, vol. 10, University of Toronto/Université Laval, 2003–, accessed April 20, 2019, http://www.biographi.ca/en/bio/logan_william_edmond_10E.html.